For those of you who can give or take a few inches when considering screen size, you can still get TVs up to 40 inches for less than £500, but the big question is what do you plan to use it for? For movies and gaming, you really are better off spending that little bit extra and going for 4K, so keep your eye out for cheap TV deals whenever you can. The SAMSUNG UE50MU6120, for example, is an all-round winner when it comes to screen size and resolution, but like we say, it doesn’t have 3D, so it’s down to you to decide if that’s a deal breaker. For those looking to refine their budget even further, keep an eye out for some of the top brand names currently offering feature packed interfaces such as Toshiba and LG for a reliable Smart Hub. If crisp, clear images are what you’re after, then you can expect a fully immersive experience when watching movies on this TV. It’s huge, with a 50 inch screen and certified UHD quality which means you really can’t get any better on quality when looking for the best TV under £500. As well as being ideal for movies and gaming, you’ll get all the smart hub features too, so you can keep up to date with the latest TV shows or catch up on Demand when you need to. This TV from Panasonic boasts pretty much the same quality and features of the Samsung, but it’s just a little bit smaller. So if you think 50 inches is really just a little bit excessive, then this 40 inch model might be just the right size for you. If it’s gaming you plan to use it for, then you can expect the smaller screen combined with 4K upscaling to only enhance your visual experience when playing on this TV. Users have found this television to be very intuitive with fast responses, and similarly to our top pick, you still get all the features of a smart hub for your general TV binges. If you’re looking for a TV that all the family can enjoy, then you can expect great things from this Hisense model. It boasts one of the largest screens at 50 inches, 4K picture quality and a fantastic range of over 70 digital channels so you can watch anything from movies to sport. It is Wi-Fi enabled with a range of outlets and ports to connect other devices such as games consoles and Blu-ray players, plus the parental controls function allows all the family to enjoy this television without the kids stumbling across unauthorised content or exceeding their screen time for the evening. This TV is said to be a little underrated as many of the bigger brand names tend to take over. However, those who bought this TV found it to be exceptionally good in terms of both sound and picture quality. It features a Dolby Sound System combined with Ambilight, which is designed to make the screen appear wider than it is (Not that it’s not already wide at 43 inches). If you’re looking for a TV under £500 that doesn’t skimp on features or quality, then you’ll be surprised at what this Philips model has to offer. If you’re not too worried about having the best of the best right now, but more interested in having a TV you can rely on to serve you well for years to come, then this is the best TV under £500 for you. Sony is a popular brand, and they don’t disappoint when it comes to reliable, easy-to-use tech. Those who have this TV say it is incredibly intuitive to set up and it also has a ‘record to USB’ function, which allows you to keep track of all your favourite TV shows and movies. This isn’t a smart TV, but you can always look at pairing it with the best TV streaming devices so you’ll be able to keep up to date with Netflix, Amazon Prime and much more. 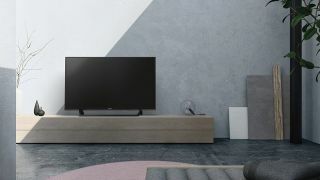 LG are a brand often forgotten about when it comes to tech, but this sleek and sophisticated model is actually very popular amongst users for its range of features. It’s compatible with magic remote, so if you’re a gadget lover, then this might just be all the reason you need to choose this telly. Other than this this TV is regarded as a hassle-free smart hub that provides quality way beyond what would be expected in this price bracket. The speakers on this TV aren’t the best, but if you’ve got money left over in your budget, why not pair this TV with a soundbar to enhance the quality. Very similar to the LG, Toshiba surprises audiences with its impressive performance. From a Wi-Fi enabled smart hub that is said to provide a speedy connection, to a Dolby Digital Plus sound system which you can expect to be all you need for an immersive movie or gaming experience. At such a low price this is one of the best entry level 4K TVs under £500 on the market right now. Smart features and TV streaming apps come as standard with this TV, so no extras are required. Now that you’ve picked which TV you want, figure out the perfect position for it in your home with our list of the best TV stands.